As I stood up to admire my feat, a fireman drove by in his firetruck. I’m a woman, so when he quickly backed up, I thought, “YES!” However, he just shouted down from the window, “Duct tape fixes everything!” and drove on. Traumatic. 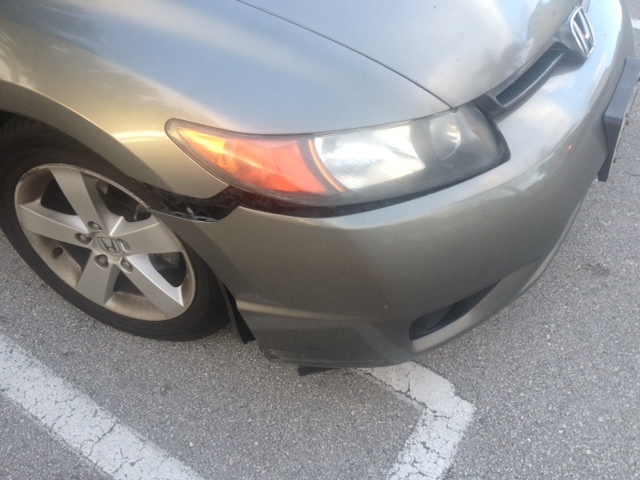 Today I drove to work at the University of Miami in my duct taped Honda Civic. When I was in college, I was a nanny for two girls. They lived in a wealthy suburb in the Denver foothills. One of my responsibilities was to pick them up everyday from school. At the time, I was driving a 1998 Saturn that was on its last leg. At one point, the stereo was broken (and/or possessed), as it would randomly turn up in volume. When I say, “randomly turn up in volume,” I mean, “randomly turn up in ear-deafening-uncomfortable volume.” Somehow, it would also always find a way to change stations to Christmas music or Spanish music. I told them this was a character building experience. And everyday for the last month, I’ve held onto the hope that it is a character building experience for the professor to hop out of her duct taped car when her students roll up in Land Rovers. When I got to work today, one of the first things I did was take my personal laptop to our IT guy. Last night when I was trying to catch up on old episodes of Homeland, the blue screen of death erupted across my screen. I figured it must’ve been terrorists. Our IT guy, though, said it was my hard drive. He suggested I call Dell to see if my computer was still under warranty. When I got back to my office this afternoon, I called Dell. I was nicely surprised when I wasn’t put on hold for eternity and when the guy who answered my call spoke perfect English. He and I had fun together for nearly two hours as he ran an insane number of tests on my computer system and I continuously kindly reminded him that someone had already done this for me. Not only had someone already done this for me, but someone had already told me what the problem was. I was just calling to ensure my computer was under warranty and to have them send me the parts necessary to fix the hard drive. “But Miss Jessop, we just need to run one more test to see what’s wrong with the computer.” “You’re the expert, man. Do your thing.” Two hours later my new friend said, “Well, Miss Jessop, thank you for your patience. The problem is with the hard drive. We’ll be sending you a new one.” Luckily for this guy, I value new friendships, so I appreciated the chance to build a new one with him as we painstakingly re-identified the problem. I have a lot of work to get done that involves using a computer, and generally, the blue screen of death would cramp that plan. However, the University of Miami bought me a nice iBook earlier this semester. So, when I left work, I packed that baby up and planned to go home and work my little heart out. 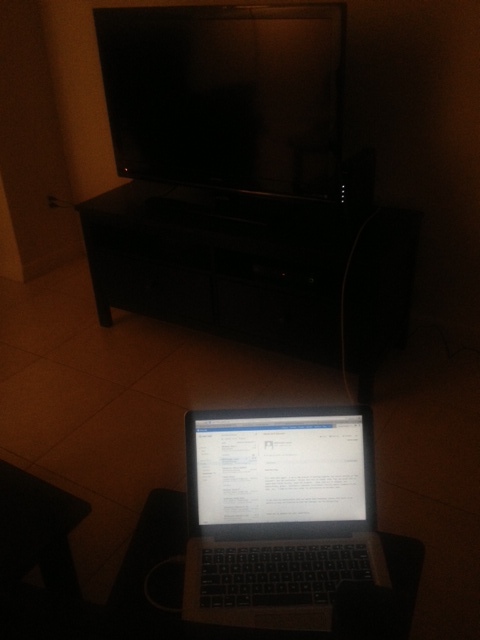 In August, I moved into a new condo in Miami. The cable guy came a couple days after I got here. He was really flirtatious and as he spewed cords across my condo in the name of bringing TV to it, he said, “Miss Alicia, I am really going to hook you up!” I said, “Ok, that would be appreciated.” He said, “Miss Alicia, I am going to give you wireless for free!” I said, “I thought I was already paying for that?” He said, “No Miss Alicia, I take care of you. Just don’t tell them I am doing this.” As I was mostly confused as to what in God’s name was going on since I ordered a wireless router, I just nodded in agreement. He said, “Ok, I’m going to set your password for you, so you can enjoy wireless for free!” I thought nothing of it, like for instance, that I cannot call my cable provider to find out what my wireless password is should I do what I always do with my wireless password: forget it. So now, I sit here with this finagled set-up: In case you can’t tell, that’s a short USB cord stretched from my cable box to a haphazardly placed kitchen chair. On my drive home tonight, it started raining. 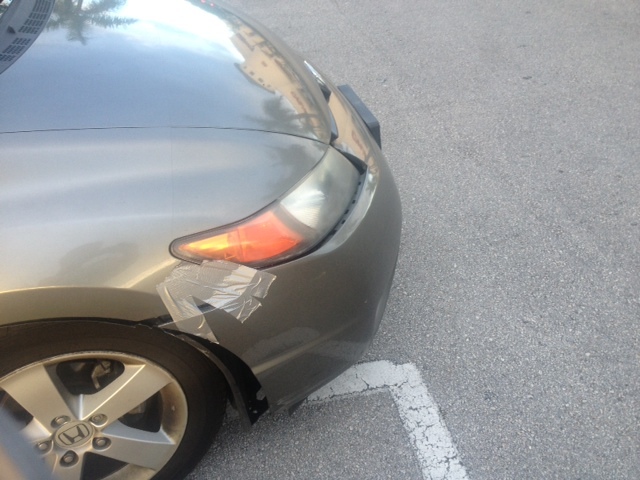 When I got home, I realized that the rain had washed away my car’s duct tape job. The fender is once again hanging on by a string. I am a firm believer that the universe sends situations into your life to see how you respond to them. When frustrating things happen in life, the quick response is often, “woe is me.” I like to look at frustrating situations as opportunities for character growth. What kind of patience am I exhibiting towards others when I am undergoing these types of situations? What value do I place on material objects and how big of a role do they play in my life? How kind am I to others when I am in a stressful or annoying situation? The frustration that today could’ve turned into, in all honesty, brought me a lot of laughs. They say that when it rains, it pours. We all have days that start out perfect and end up hilariously disastrous. Life is about perspective, though. The best perspective, I’ve found, is to laugh when life sends you a rainy day. Yup. 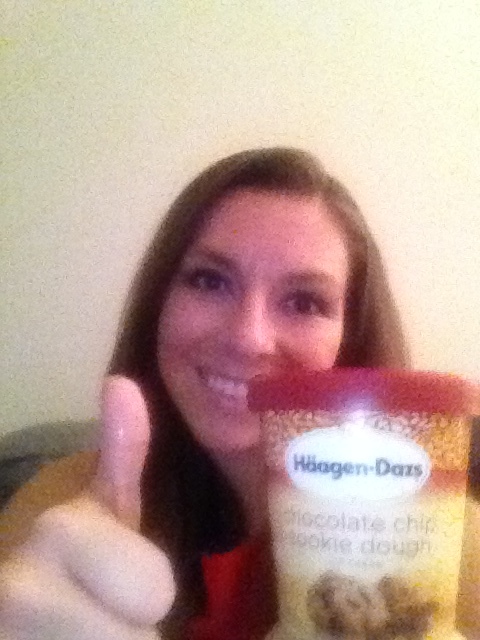 That’s Haagen-Dazs Chocolate Chip Cookie Dough for dinner, baby.